Earlier this month, Ann Arbor Downtown Development Authority executive director Susan Pollay received a 5% raise from the DDA board. That brought her annual compensation to $114,570. The free response portion of a performance evaluation for Ann Arbor Downtown Development Authority executive director Susan Pollay. The DDA board appears to have decided her salary increases in FY 2013 and FY 2014 in a way that did not conform with the Open Meetings Act. The procedure used this year by the board to award Pollay a salary increase appears to have conformed completely with the requirements of Michigan’s Open Meetings Act (OMA). However, that procedure was different from the one used to award raises to Pollay in each of the two previous years. That conclusion is based on records produced by the DDA to The Chronicle in response to requests made under Michigan’s Freedom of Information Act (FOIA), as well as records the DDA was not able to produce. The analysis below begins with an overview. Responding to a request made by The Chronicle under Michigan’s FOIA, the only documentation the DDA produced for board authorization of the two previous years’ raises was two letters. The letters were sent by former board chair Leah Gunn to the city of Ann Arbor’s human resources staff – dated Oct. 9, 2012 and June 27, 2013. Those letters don’t appear to describe the salary decisions by the board in ways that meet basic OMA requirements. Specifically, OMA requirements do not appear to have been satisfied for either the board as a whole, or for a subquorum committee of the board – which DDA board members may have assumed was acting lawfully on behalf of the entire board. By way of contrast, this year the board voted on the question of a salary increase for Pollay at its regular meeting of July 2, 2014. That vote, in open session on a written resolution, came after a roughly 15-minute closed session held by the board on Pollay’s performance review. A personnel matter like a performance review – if the employee requests it – is one of the limited number of reasons under Michigan’s OMA that a public body can bar the public from a meeting. That procedure, including the vote in open session by the board, is familiar from The Chronicle’s coverage of other public bodies. It’s a procedure that conforms with the OMA. However, for neither of the two previous years did the DDA board discuss at any of its meetings the question of salary increases for its executive director. Nor did the board hold a closed session on a personnel matter during that period. Nor did the board vote on those salary increases at any of its meetings. Some DDA board members might have assumed the board’s executive committee had authority to act on the board’s behalf in deciding executive director salary questions. But in response to a request made under Michigan’s FOIA, the DDA was not able to produce any records with documentation that the performance review of its executive director and recommendations on salary increases have been specified by the board as duties of the executive committee. And even if the executive committee had been tasked by the board with those duties, the DDA was unable to produce any records of minutes for its executive committee meetings during the relevant time period. Further, it’s not clear that the executive committee posted adequate public notices of its meetings during this period, or that the typical location of executive committee meetings – the executive director’s personal office – can be considered accessible to the public under the definition of the OMA. Concerns raised by the material that was provided to The Chronicle under Michigan’s FOIA are not limited to questions about the openness of decision-making procedures – as measured against the requirements of the OMA. The written performance reviews of Pollay are heavily weighted towards general expressions of support and commentary on Pollay’s personality, instead of providing important critical feedback on performance. Laid out in detail below are the arguments that the decisions to award Pollay a raise in two previous years – for FY 2013 and FY 2014 – were made in a way that violated the OMA. The analysis concludes with a note on the oversight role of the city council with respect to the DDA. At its July 2, 2014 meeting, the DDA board voted to award its executive director, Susan Pollay, a 5% pay raise for fiscal year 2015, which started July 1. That brought her annual compensation to $114,570. During board deliberations on the resolution, long-time DDA board member Roger Hewitt mentioned that Pollay had received good raises the two previous years. The July 2, 2014 DDA board deliberations framed that salary history as the equivalent of only a 1.9% annual raise since 2006. Board members indicated an interest in raising Pollay’s salary in future years, to bring it into alignment with the mid-point of the salary range for her city of Ann Arbor “Level 2″ position. That midpoint is $126,000 – in a range from $95,340 to $157,312. City administrator Steve Powers cast the sole vote of dissent on the board’s July 2 action to increase Pollay’s salary by another 5% in FY 2015. He felt that 3% was more appropriate. He also expressed a desire to see a more robust evaluation process in the future. When Hewitt mentioned at the July 2 DDA board meeting that Pollay had received raises for FY 2013 and FY 2014, that was likely a revelation to anyone outside the DDA board. The Chronicle’s coverage of the DDA since 2008 – which includes reporting on all DDA resolutions approved by the board – does not reflect any board discussion or votes on pay raises for Pollay during that period. A machine search of the DDA’s board meeting minutes available on the DDA’s website produces a single search result for the phrase “performance evaluation” – from 1997, which is a year after Pollay was hired as DDA executive director. Based on the DDA’s July 10 response to that request, only two records are in the possession of the DDA that document any authorization for Pollay’s salary increases in FY 2013 and FY 2014. The two records are letters sent by the board chair at the time, Leah Gunn, to city of Ann Arbor human resources staff – dated Oct. 9, 2012 and June 27, 2013. What about Gunn’s letters? They do not indicate in an explicit way when the board as a whole might have made its salary decisions in FY 2013 and FY 2014. However, the first of Gunn’s letters, written three months after she was elected DDA board chair, refers in a general way to the executive committee of the DDA board, and its role in Pollay’s performance evaluation and salary adjustment. It’s important to consider, for the sake of argument, the possibility that the board’s executive committee might have acted lawfully on behalf of the board, and that the executive committee acted in a manner that was consistent with the OMA. Some background on the executive committee is presented first, before evaluating possible decisions by the committee – with respect to the OMA and the DDA’s bylaws. The executive committee of the DDA board is a subquorum subset of its members – the chair of the board, the vice chair, secretary and treasurer. Ex officio non-voting members of the executive committee are the executive director and the immediately preceding board chair. So during the most recent year in which Leah Gunn chaired the board – from July 2012 through June 2013 – the executive committee consisted of Gunn, Sandi Smith (vice chair), Keith Orr (secretary) and Roger Hewitt (treasurer). The two non-voting members of the executive committee were Pollay and Bob Guenzel. So to the extent that the executive committee might have made the decisions on salary increases for Pollay in FY 2013 and FY 2014, those decisions were required to have been made in accordance with OMA requirements – including those on noticing meetings to the public and on maintaining minutes for its meetings. The letter from Gunn about the FY 2014 salary increase does not mention the executive committee, but rather only the board. However, Gunn’s letter about the FY 2013 salary increase for Pollay describes a meeting of the executive committee in a way that at least hypothetically could have been held in conformance with the OMA – a meeting at which the committee might have made a decision to authorize a pay increase for Pollay for FY 2013. During the course of this work, I spoke with every member of the board and I brought their feedback to the October meeting of our DDA executive committee where we met with Susan to discuss their comments (which by the way were unanimously excellent). We are in complete agreement about adjusting the salary of our executive director to $102,264 from her current salary. Although Gunn does not give the exact date of the October executive committee meeting, it is possible to infer that it took place on the same date as the DDA board meeting that month, which fell on Oct. 3, 2012. The first occasion on which The Chronicle attended a scheduled meeting of the executive committee was March 5, 2014. The meeting was held in Pollay’s office. There is no signage at the DDA offices that would alert someone to the fact that the executive committee meets there, as opposed to the board’s meeting room. The board’s meeting room is immediately apparent on exit from the elevator that opens onto the third floor of 150 S. Fifth, where the DDA rents office space. The DDA’s management assistant, Jada Hohlbrook – who staffs a reception desk – directed The Chronicle to the specific location of the executive committee meeting, which requires a couple of turns to arrive at Pollay’s office at the back of the DDA suite. The March 5 meeting was attended by only one voting member of the committee – Keith Orr. The following month, on April 2, 2014, attendance was perfect. A member of the public, Changming Fan, attended the April 2 meeting. When he arrived at the doorway to Pollay’s office, executive committee member Roger Hewitt advised him that he could not stay, as it was a meeting only for the executive committee of the board. If Hewitt thought the public could be excluded from the meeting, it’s not clear why he did not attempt to exclude The Chronicle – already sitting in plain view. In any event, Pollay told Hewitt that executive committee meetings were open to the public. Changming Fan and The Chronicle remained through the end of the meeting. It’s fair to conclude that the conditions under which the executive committee meets are at least somewhat dubious with respect to satisfaction of OMA requirements. The next part of this analysis focuses on issues that are clearer cut. Starting with the April 2, 2014 board meeting, after a gap of more than four years, the DDA began producing executive committee minutes for approval. That’s an implicit recognition, possibly on prompting from The Chronicle, that the executive committee is actually required under the OMA to keep minutes – if it is acting on behalf of the board as a whole. That requirement applies, even though the executive committee is a subquorum set of board members. [.pdf of AG Opinion #7000]. Let’s assume for the sake of argument that the DDA’s position is that the executive committee acted twice on behalf of the full board to increase the executive director’s salary during the period of July 2012 through June 2013. On that assumption, the fact that no minutes have been produced for the meetings during which those decisions were made is an ongoing violation of the OMA. And action could be taken in Washtenaw County’s 22nd circuit court to ask that court to enjoin the DDA against this ongoing OMA violation by ordering the DDA to produce minutes for those meetings. Possibly a more significant question, however, is whether the executive committee of the DDA board is even empowered to act on behalf of the DDA board with respect to executive director salary issues. Executive Committee Action: Power to Act? The executive committee shall fix the hours and place of meetings, make recommendations to the board, and shall perform such other duties as specified in these by-laws or as may be specified by the board. So even if the executive committee made two decisions on the executive director’s salary sometime between July 2012 and June 2013 – undocumented by any meeting minutes – it’s not clear that the committee was even empowered under the DDA’s bylaws to make those decisions. For the free-response portion of the evaluations, board members in many instances appear to have copy-pasted from that set of suggestions – either wholesale or in part. With respect to the objective scoring portion of the form, board members have in many cases simply filled in the objective scoring portion of the form with the maximum score for the first few items (15). They have then “auto-filled” the rest of the items – apparently not noticing that the maximum score for items at the end of the list is a different number (10). 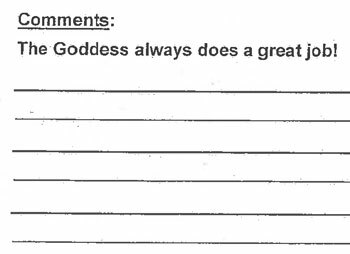 The set of one-page evaluations provided to The Chronicle also includes some that are apparent duplicates with respect to content – even though the sheets of paper that were scanned for The Chronicle are different. 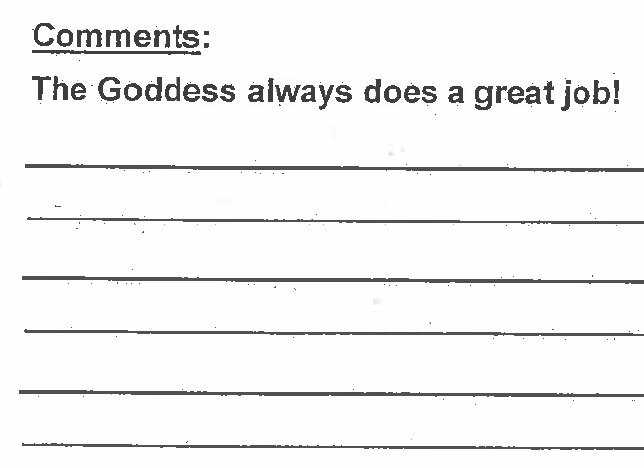 An example of that is the “goddess” evaluation. That evaluation appears twice in the set – but only one of the two scanned pages includes the handwritten year “2011″ at the top of the page. In this context it’s worth noting that city administrator Steve Powers’ July 2, 2014 vote of dissent on Pollay’s salary increase included by way of commentary a hope that in the future the evaluation process could be more robust. Ultimately it is the Ann Arbor city council – as the governing body of the municipality where the DDA is established – that has responsibility for oversight of the Ann Arbor DDA board. It is the city council that confirms the appointment of DDA board members. And it is the city council that can potentially remove members from the board for cause. And if we talk about goals, my goal – and I think it’s incumbent upon the city council, I don’t think that the DDA has done anything wrong per se, it’s just that the city council historically has not held the DDA accountable in terms of understanding what that is. However, based on the city of Ann Arbor’s response to a request made under Michigan’s FOIA, Ann Arbor’s city council did not explicitly approve Pollay’s initial hire or her compensation level in 1996. Nor has the council approved the new compensation levels in the last two years. In more detail, on Oct. 18, 2013, The Chronicle made a request to the city of Ann Arbor under Michigan’s Freedom of Information Act for all records documenting Ann Arbor city council approval of the employment of Susan Pollay as director of the Ann Arbor Downtown Development Authority. On Nov. 7, 2013 the city of Ann Arbor responded with copies of all of the Ann Arbor city council’s annual budget resolutions dating from 1997 to the present, which include the DDA budget (as a component unit of the city), but not in line-item detail. But no record of a council resolution specifically and explicitly approving Pollay’s hire or compensation was produced by the city of Ann Arbor in response to that request. 1. As required by the Downtown Development Authority Act, Act 197 of the Public Acts of Michigan of 1975, MCL 125.1561, et seq., and the Rules of Procedure of the City of Grand Rapids Downtown Development Authority (the “DDA”), the selection of Kristopher M. Larson as Executive Director of the DDA is hereby approved. The Ann Arbor city council might be able to render somewhat moot the OMA questions raised in the analysis above, by taking an affirmative action. That action would be to consider and pass a resolution that approves the pay increases given to Pollay in the last two years, as well as this year. An additional action available to the council would be to pass a resolution requesting that the DDA board produce minutes for the meetings during which executive director salary adjustments were made for FY 2013 and FY 2014. But given the backdrop of a Democratic primary race for mayor that includes four councilmembers, the politics of those actions could be delicate. In addition to Petersen, Sabra Briere (Ward 1), Christopher Taylor (Ward 3) and Stephen Kunselman (Ward 3) are also running. Kunselman has made efforts over the last few years to lead the council to exercise more oversight of the DDA. But those efforts have been fraught with the perception that they are purely political in nature – even when the issues Kunselman has identified have merit independent of their political dimension. DDA board members have on occasion openly criticized Kunselman for his actions, or resorted to anonymous Internet commenting in defense of the DDA’s position. Sandi Smith, for example, has admitted to The Chronicle that in response to a published Chronicle opinion piece, she left a comment on that op-ed under the screen name “Eco Bruce.” The comment in part attempted to dismiss criticism about the DDA’s apparent failure to adhere to the city’s ordinance on TIF capture – by implicating that this criticism is rooted in “Director K’s [Kunselman's]” desire to be CEO [mayor]. Smith was DDA board vice chair at the time. With respect to the situation about Pollay’s salary, the politics are especially a challenge – because it would mean approving a nearly 21% increase for Pollay, when computed over the last three years. That’s a period during which other city non-union employees received slightly more than a 6% increase – a $1,000 lump sum in FY 2013, 3% in FY 2014, and 3% for the current fiscal year. Adding to the political challenge is the fact that it’s Leah Gunn who appears to have led the DDA board effort to increase Pollay’s salary in the two previous years – in a way that escaped public attention. Gunn, a former elected official and long-time Democratic activist, is treasurer for Christopher Taylor’s mayoral campaign. It is articles such as this one that remind us that robust journalism – annoyingly robust journalism – is an essential part of democracy. Without casting aspersions on anyone’s motives, character or integrity, The Chron has documented well that Ann Arbor government is full of the most common, and most pernicious, vice known to man: moral laziness. Democracy live and dies on public accountability. Robust journalism is the foundation of accountability. While to some, DDA pay may seem like a tempest in a teapot, if we cannot hold city council accountable for performing its oversight job, and we cannot hold the DDA accountable for following the law, don’t expect to hold anyone accountable for “Extraordinary Renditions”, not-tourture in Gitmo, or phantom weapons of mass destruction. We really do set the duck for government in general, at the local level. It is human nature to try to get away with whatever those around us will allow. Kudos to The Chron for its usual excellence. The issues raised here would make excellent questions for the four mayoral candidates, and for those running for council, between now and the primary on August 6th. For that matter, they would make great questions for elected officials after August 6, as well. If we want this kind of journalism in Ann Arbor, we have to subscribe to the paper that delivers it. August 6th, isn’t that when all the Republicans are supposed to vote? The most dangerous people in the city of Ann Arbor are those appointed to positions of power. Appointed taxing authorities like the DDA and AAATA have for years run roughshod over public opinion, city charter requirements, and state law. They give already overpaid executives raises, make decisions out of the public eye (no surprise there), and spend public money like drunken sailors. Who on City Council has the leadership to reign in these out-of-control organizations? At least the city administrator’s presence has brought a new perspective to the room. I wonder if the mayor realized that that might happen. Can you report the TOTAL salary that Susan Pollay receives, by which I mean her salary which was just increased and then her fringe benefits that can amount up to 80% of her salary? Also does Susan Pollay have a Go!Pass card and, if so, why?